This is an example of how I would begin planning for a workshop. 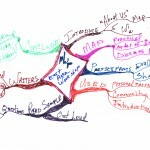 This particular map is of a possible plan for a Writer’s Workshop for teachers. The map will be redone when I have to start developing the complete workshop. This was my effort to get something downon paper – the beginning. Click on image for a larger view. I dugg ya girl! Best of successes. Mind chi comes out in the UK…. THIS week!!! AND did you know I was getting married!!!!!! Life in the ole girl yet!